- FOR APPLICATIONS UP TO 600 H.P. These Race Built converters provide superb performance, reliability and efficiency in most Street, Street/Strip, High Performance and Bracket Racing applications. * At flash stall, the converter multiplies the torque being produced by the engine at that specific r.p.m. by up to 2.5 times, to the drivetrain. The further into the powerband of the engine, that flash stall occurs, the higher the torque number that you multiply, resulting in much more power to the rear tires to accelerate the vehicle. Ideally, a flash stall at the peak torque rpm of your engine will produce the best race perforrmance. FOR STREET APPLICATIONS, the unique design also makes these converters an excellant choice for any vehicles with aftermarket camshafts and/or performance improving upgrades used on the street. 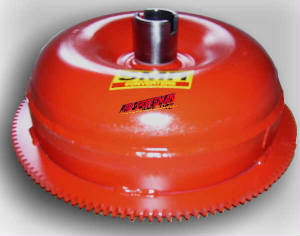 Our 10 3/4" ProSportsman,is a very streetable converter, without the normal throttle r.p.m. flair up and the need to rev the engine to get it moving, encountered with other brands of converters. Even when used with overdrive, steep rear gear ratios (eg: 3.23:1), our 10 3/4" unit operates like a stock converter, under normal driving conditions both around town and on the open highway. When used with engines with increased duration, higher lift camshafts, this, converter will absorb the lope and surging at idle when sitting a traffic light or in traffic in gear, to prevent stalling and engine load-up, making such modified engines much more streetable. However, just like under race conditions, when the accelerator is floored from a standing start, the converter flashes to its' designed r.p.m., pauses at this r.p.m. point while multiplying torque to the driveline (by up to 2.5 times what the engine produces) until the driveline reaches this speed and then the rpm increases as it would with a stock converter. IN ORDER TO WITHSTAND THE PUNISHMENT OF HEAVY DUTY, HIGH PERFORMANCE and COMPETITION USE, THE SMR PRO SPORTSMAN RACE TUFF series, CONVERTERS ARE PRECISION BUILT WITH THESE FEATURES. full FURNACE BRAZING of the Turbine and Pump fins - providing superb strength without interfering with fluid flow or creating aeration. 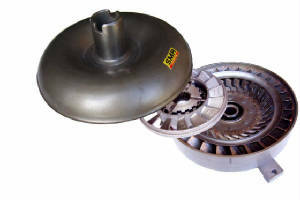 enclosed TORRINGTON BEARINGS between the cover and turbine, turbine and stator and stator and pump cover - reducing friction between components operating at different speeds - resulting in improved performance and reducing wear and heat build-up. FORGED STEEL inner & outer SPRAG races on a HEAVY DUTY ROLLER CLUTCH (sprag) - to withstand the extreme load demand during torque multiplication (launches) of flash stall. new ALLOY STEEL PUMP DRIVE (converter neck) to withstand high r.p.m. and high fluid pressures created by heavy duty to competition transmissions. This drive is precision machined to assure maximum converter pressure and precise alignment with crankshaft pilot preventing high speed vibration and component wear. precision machined PILOT and MOUNTING PADS to assure precise alignment and secure crankshaft attachment. the turbine is INTERNALLY BALANCED and the pump cover and front cover are also balanced - to provide a vibration free operation at any r.p.m. 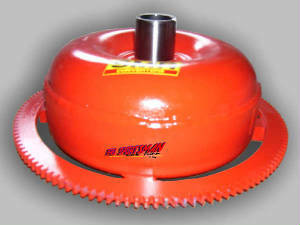 the precision welded converter is PRESSURE TESTED to detect any possible leaks and then painted a temperature sensative, high gloss ORANGE to detect an overheating condition. OPTIONS AVAILABLE for Special Applications include: CUSTOM DIMENSIONS (for engine plates, special adapters, rare spline combinations, etc. ), ENGINE BALANCING WEIGHTS and ALTERED BOLT PATTERNS.